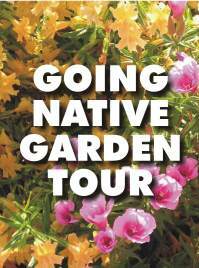 The Going Native Garden Tour of Santa Clara County and San Mateo County will take place on Sunday, April 18, 2010, 10am to 4pm. There are about 50 gardens on the tour, mostly private home gardens. The format is open house; all registrants receive garden addresses and descriptions two weeks in advance, and choose which ones they want to visit. The tour is in its 8th year now, and attracts a large audience. It is free to all; registration is required at www.gngt.org. We had 5,000 registrants and 12,000 garden visits last year. So register early to reserve your space.